Your Own Backyard Paradise finally within Reach. If you’re ready to commit to a portable spa purchase and interested in increasing your home’s value, there are a couple of things you can do that will make your efforts worthwhile. When it comes time to putting your house on the market, a hot tub can make the home a hot property. Portable Spas have another real benefit: They generate interest. Homes with spas may get more inquiries when the home is up for sale. To calculate a ballpark estimate of your spas value once installed, the best thing to do is to consult a certified home appraiser. Real estate professionals may also be of assistance. Here are some helpful tips American Spas has for you to keep in mind on how to upkeep your spa and what to do if you’re planning on putting your home on the market. First, ensure the spa’s placement is well incorporated into the overall backyard design, so it will be included in the value calculation. At the very least, add attractive landscaping where applicable to maximize its aesthetic appeal. Start at the top. Make sure your hot tub cover is fresh, either new or scrubbed clean. You can leave the tub open to show off a water feature running on low speed. Check your cover lifter to make sure it’s in top working order. Next, make sure it’s well maintained: replace any worn out parts and components, replace filters, and do all required maintenance. Clean your spa thoroughly to ensure it looks like new for realtors and potential buyers. Sparkling water is everything. Pay attention to the water pristine, sparkly clear, reflecting the bright lights with a little clarifier to enhance the bluish tone of the water. Landscape around outdoor spas. Present your spa area as a tempting retreat from the surrounding world. Use privacy panels to create some intimacy, install mood lighting, plant greenery, make a brick or concrete path leading to the spa anything that will help blend the spa into the home environment and increase appeal. Make the setting irresistible. Arrange some nice towels and sparkly flip flops in a basket with pleasant fragrances near your spa, maybe some inviting chairs and a plant stand or two, and hang a couple of fluffy new robes on a robe tree. Lastly, be sure you’ve picked up a quality unit, one that will last 10 years or more a cheaper unit or one that’s purchased used will not last nearly as long. Many factors go into determining the value of the home. However, a water feature like a spa that adds value to a home can increase you’re homes worth, especially if that feature is a complement to the property. People shopping for homes are looking for a place to relax. 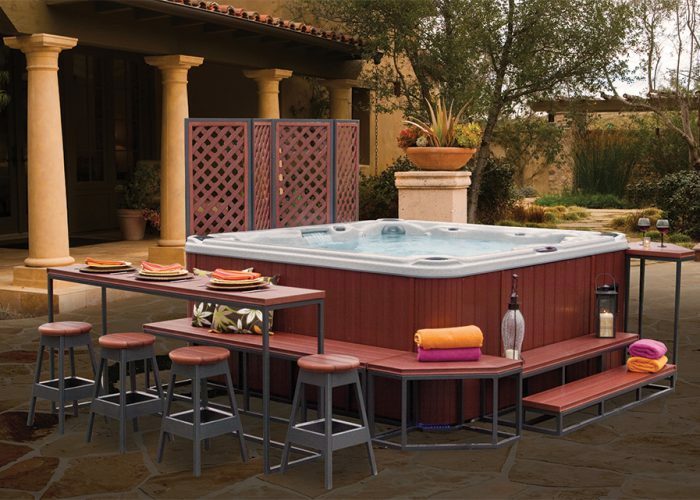 When you stage your hot tub the right way, the setting can convince them that yours is the spot resulting in a faster sale. For quality and luxury spas worth the investment Click the Image below to see our full online line up.